Home / Washing Machines: Clean Up on Savings! / Washing Machines: Clean Up on Savings! The average American family washes about 300 loads of laundry each year. 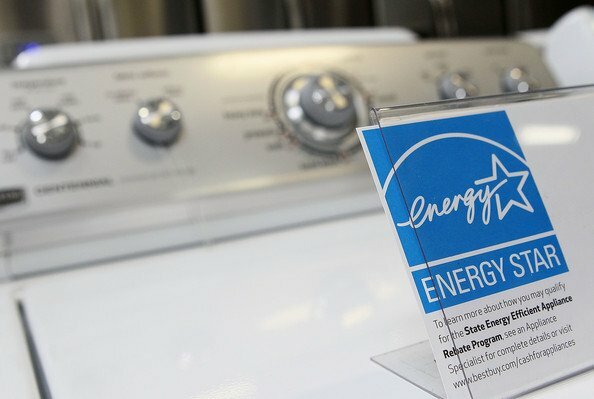 ENERGY STAR can help families cut their related energy and water costs by helping to identify washing machines certified to use about 25% less energy and 40% less water than regular washers. Use less energy. One the average, a new ENERGY STAR certified clothes washer uses 280 KWh of electricity and can save you $40 a year on your utility bills compared to a standard model. Use less water. A full-sized ENERGY STAR certified clothes washer uses 13 gallons of water per load, compared to the 23 gallons used by a standard machine. That’s a savings of more than 3,000 gallons of water, per year!! Is your washer over 10 years old? It’s estimated that there are 76 million top-loading washers, 25 million of which are at least 10 years old, still in use across the country. Washers built before 2003 are significantly less efficient than newer models. Together, these inefficient washers cost consumers $2.9 billion each year in energy and water. If you have a standard clothes washer that is over 10 years old, it’s costing you, on average $180 a year. Always use HE (High Efficiency) detergent. Front-loading clothes washers are designed to use High Efficiency detergent. Using regular detergent creates too much suds, which will affect the machine’s washing and rinsing performance. Over time, it can lead to odors and mechanical problems. Clothes washers use about the same amount of energy regardless of the size of the load, so run full loads whenever possible. Water heating consumes about 90% of the energy it takes to operate a clothes washer. Unless you’re dealing with oily stains, washing in cold water will generally do a good job of cleaning. Switching your temperature setting from hot to warm can cut energy use in half. Using the cold cycle reduces energy use even more. Use a drying rack or hang clothes outside. This super hot cycle, available on some models, increases energy use significantly. Only use it when absolutely necessary. Activate the high spin speed option. If your clothes washer has spin options, choose a high spin speed or the extended spin option to reduce the amount of remaining moisture in your clothes after washing. This decreases the amount of time it takes to dry your clothes. Leave the door open after use. Front-loading washers use airtight seals to prevent water from leaking while the machine is in use. When the machine is not in use, this seal can trap moisture in the machine and lead to mold. Leave the door ajar for an hour or two after use to allow moisture to evaporate. Make sure children do not climb into the machine while the door is open. Rinse the washer every month. Some manufacturers recommend rinsing the washer each month by running a normal cycle with 1 cup of bleach to help reduce the risk of mold or mildew buildup. Consult the product owner’s manual before attempting. If every clothes washer purchased in the U.S. was ENERGY STAR certified, we could save more than $4 billion each year and prevent more than 19 billion pounds of annual greenhouse gas emissions, equal to the emissions from 1.8 million vehicles.